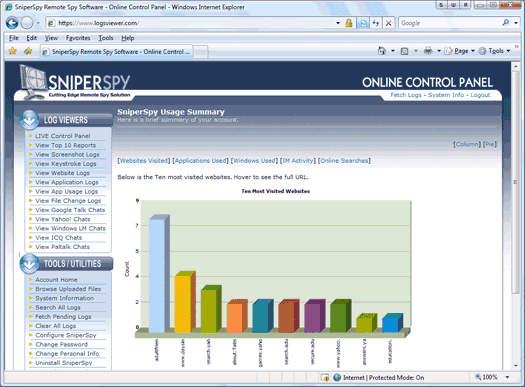 Our review of SniperSpy monitoring software. 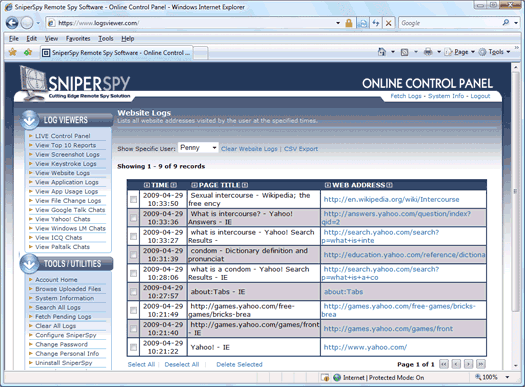 Learn about all of the features SniperSpy offers and compare SniperSpy to other similar programs. View Screen in Real Time. Browse the File System in Real Time. View / Kill Processes in Real Time. Secure Fully Featured Control Panel. Monitor From Anywhere that has Internet! Actual Screenshots - Screenshots of the actual computer screen are captured, displaying whatever your son, daughter, or employee are doing on your remote computer. Websites Visited - A list of all websites visited using the computer's web browsers will be recorded. You'll see every Internet site, good or bad, that they view. Keystrokes Typed - Every keystroke that they type while using the PC will be recorded. Each logged record will show what was typed and which program or window it was typed. PC Location Mapping - Your remote PC's general location will be recorded based on its IP address when uploading logs. You can even see the location on a map using built in links. Chat Conversations - Every instant messenger chat conversation that occurs on your computer will be recorded, showing both sides of the conversation and the full user names of those in the conversation. Other features included are the ability to see how long applications are being used, the ability to see all applications and software that have been executed on the monitored PC, and several live monitoring features including a real time screen viewer, remote file browser, active process viewing, ability to launch an application remotely, and the ability to send a message pop-up to the user. Some of the features missing from this software package that we were looking for include the ability to capture emails sent, emails received, webmail monitoring, files printed, online search engine searches, window activities, activity logging, and the ability to have all emails automatically forwarded to you. Need a comparison of SniperSpy to their competition? Take a peek at the TopFiveAwards remote monitoring comparison chart to see how SniperSpy stacks up with their included features! Top 10 reports, screenshot logs, keystroke logs, website logs, application logs, software usage logs, file and folder change logs, Google Talk logs, Yahoo! Chat logs, Windows Live Messenger chat logs, ICQ logs, and Paltalk logs. Another great feature is the ability to click a "Fetch Logs" link to have the SniperSpy server reach out and request for updated logs from the target PC or Mac. Overall in our review, SniperSpy has everything you should need to effectively monitor a PC remotely. This will give you the ability to see if your children are up to something bad online or if they are listening to your rules about usage, software, music piracy, and more. SniperSpy is the only remote monitoring software that has a secure SSL https:// URL for logging into their back end for log viewing. This means your login data is encrypted and secure from prying eyes and web traffic snooping. 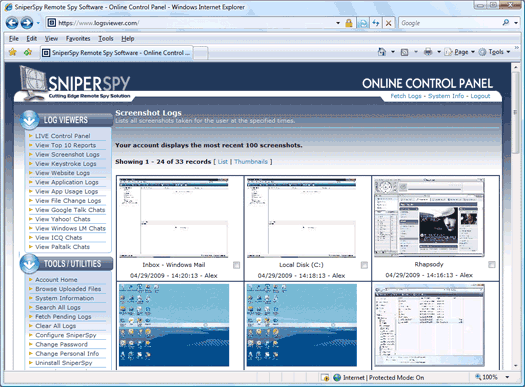 SniperSpy includes 100% stealth monitoring, remotely deployable executable that is compatible with Windows XP, Windows Vista, and Windows 7. SniperSpy's technology allows it to bypass any firewall which is a nice bonus. Other security features include the ability to install it on the target PC without any program groups or software icons (thus, no trace), a password protected login (again with SSL), and the ability to remotely uninstall the software when you are finished recording the target PC. 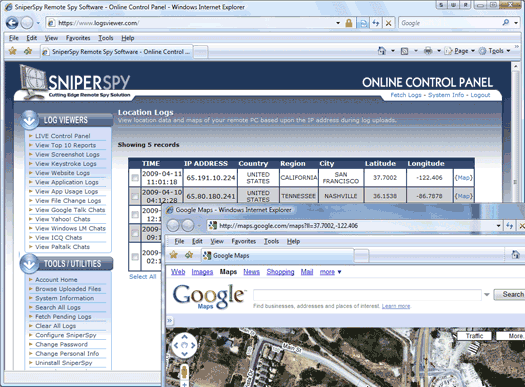 SniperSpy is a decent solution for your remote monitoring needs. Although we did find a few features missing, overall, you can't go wrong with this solution if you decide the products ranked higher in our remote monitoring software review is not for you. For Mac: Any edition of Mac OS X v10.6 Snow Leopard or Mac OS X v10.5 Leopard. A standard dial-up connection but a high-speed Internet connection recommended. The price offer above includes a 10% discount and is for one year of service.